If you are getting ready to put your house on the market, you may wonder how much of a difference paint color really makes? A 2016 Zillow Digs report compared room colors from about 50,000 homes and found that color did impact the sale price! Paint Pals of Fort Collins are expert house painters that can assist in choosing colors with mass appeal to help you sell your house for more. Yellow for the Kitchen: Surprisingly, a soft yellow (think wheat) on the walls of the kitchen was the most popular color for home buyers, earning the seller an average of $1,360 more in the Zillow study. The cozy feel of a kitchen painted in a subtly golden hue was much more appealing than kitchens whose walls were left white, which sold below asking price. 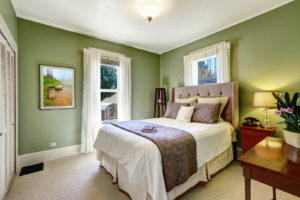 Green in the Bedroom: The next biggest return on a color choice is soothing green on the bedroom walls, as seen in homes selling with a $1,332 premium. Avoid dark brown in the bedroom, which contributed to homes selling about $230 below expectations. Purple Dining Room: Maybe the biggest surprise in the study was that homes with dining rooms painted in a neutral purple, such as mauve, brought in $1,122 more than expected! Altough gray is the best choice for living rooms, it is not popular in dark shades on dining room walls- as seen in homes selling for $1,112 under the asking price. Gray for the Living Room: Light gray works extremely well as a neutral backdrop and makes a space feel larger, bringing a $1,104 premium for homes with gray living rooms. Homes with living rooms painted an orange hue, like terracotta, sold for about $800 less than expected. Tan Bathrooms: Be sure to choose lighter shades for bathrooms to avoid making them feel cramped and dark. Homes with dark brown bathrooms sold for $500 less than the competition, while homes with light tan bathrooms netted $300 more. If your home has colors that might deter buyers or just needs a fresh coat, count on the expert house painters in Fort Collins, Paint Pals, to quickly and affordably make your house ready to list.